While searching for the Simpsons last week, I also came across the newest Target Exclusive. 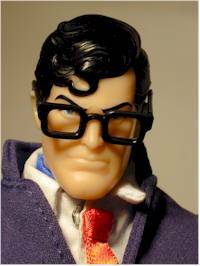 Most folks are referring to him as Secret Identity Superman, similar to the earlier release of Batman/Bruce Wayne. 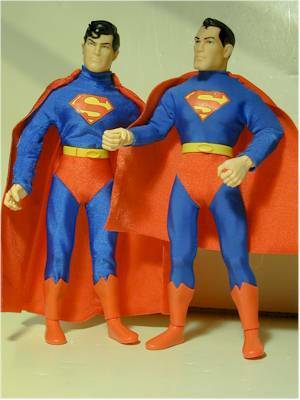 The figure comes with two outfits, to allow you to dress him as either Superman or Clark Kent. 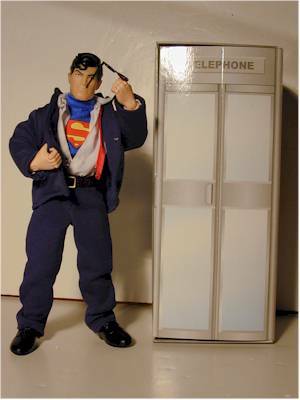 A cardboard telephone booth is also enclosed so the shy Mr. Kent doesn't have to make his transformation out in public. The set rings up at $19.99, unless you get really lucky. I've heard of a few folks finding these under the DCPI for the original Batman/Bruce set, which was clearanced at $4.94. If the moon and stars are in just the right alignment, you could end up with a heck of a deal. The packaging has improved in a couple ways, although it's still got a long way to go. It's definitely not collector friendly, but I think that Hasbro's idea of collector friendly is to pose the figure in the box in some sort of action pose, so that the MIB collector can enjoy the figure too. I'm not sure that actually matters, and it rarely works. 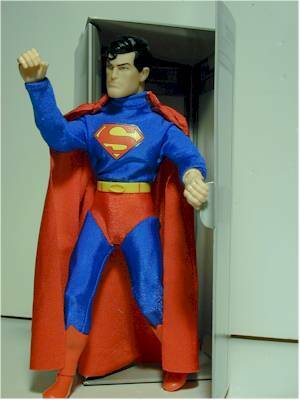 Here, the die cut front gets in the way of seeing much of the phone booth, but Kent's pose is pretty good. However, they have improved this box in terms of shelf life. It's much sturdier than the previous Bruce Wayne, and the graphics are fairly attractive and bright. 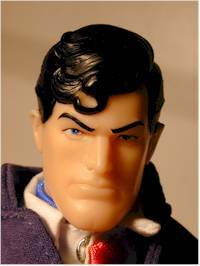 They've updated the sculpt on this Supes, giving him a little more hair and slightly different face than the previous Silver Age Superman that was a Target exclusive. I don't think the head is as big as others do, so my score is better than most folks. The sculpt itself is very good, heroic without being constipated. There aren't a lot of paint op details here, but the head is well done, and the eyes on all the ones I've seen look great. These are Famous Covers, and their articulation has never been quite as good. But the DC 9" body isn't bad in terms of points of articulation, and the gripping hands can be very useful. He has all the points you expect if you've bought one of these before; neck, shoulder, elbows, waist, wrists, bicep joint, hips, knees, hands and ankles. The only 'accessory' with this figure is the telephone booth. A nice plastic booth would have been fantastic, but it wouldn't have been a twenty dollar figure. This cardboard version is actually better than I had hoped. The cardboard is heavy stock, and while it won't hold up to much playing, it displays well. This is slightly improved area over the last Superman figure. It's still basically the same Superman uniform, however we get stitching this time around the wrists, and the cape both full length, attaches better on the shoulders, and has the appropriate 'S' symbol. 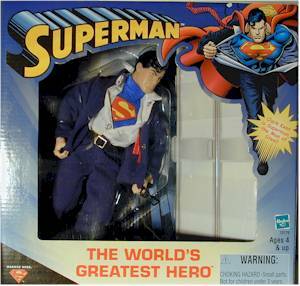 The Superman belt has several small red lines added, but is the same belt otherwise. The Clark Kent suit is fairly good looking, although it's hindered by the fact that it is worn over the Supes costume. This was the same as Bruce, and it makes the figure appear big, particularly in the shoulders and chest. The suit is made of a stretchy material, which reminds me of a bad 70's polyester suit. The shirt and pants are actually attached to each other, sort of like a jump suit. The oddest thing here is the belt - rather than make it some sort of basic velcro closure, it has a metal buckle. Probably the nicest addition to this figure over the previous Bruce Wayne is the addition of his black shoes. 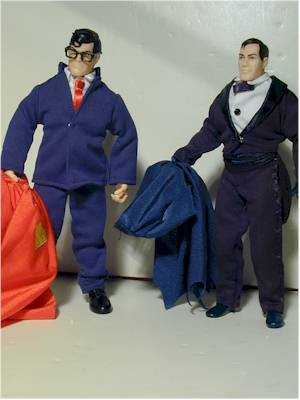 Since he has flesh colored hands, the Clark Kent version looks far more 'normal' in his street clothes than Bruce Wayne did. I sure wish I'd found these for five bucks. Ah well, $20 isn't a terrible price, although a more accurate price point for this level of quality figure is $15. The previous Bruce Wayne got **1/2 stars, and the extra half star here is indicative of the slight improvements in including the shoes, the nicer cape, and the better packaging. Unlike the Bruce Wayne figure, which didn't look particularly good in his Batman suit, this Superman looks better than the first version. This is a Target exclusive, and they seem to be in big numbers right now. I've seen them at three different Targets in just the past few days, and I bet that with the after Christmas lull, they won't fly off the shelves.